The origin of the town's name is not certain even though, historians attribute it to the name of person Donnus or Donatus, whilst others, to the Latin word "donax" (chestnut varieties typical of the area). It stretches along both banks of Baltea and divides into two parishes: On the left hand side is located the old medieval village, whilst on the right hand site the largest district of Vert is positioned, which for almost a century, between the XVII and XVIII century were distinct from an administrative point of view, creating two different municipalities. The municipality is composed of many villages and borders with the nearby towns of Pont Saint Martin, Pontboset, Perloz, Hone, Bard and Arnad. 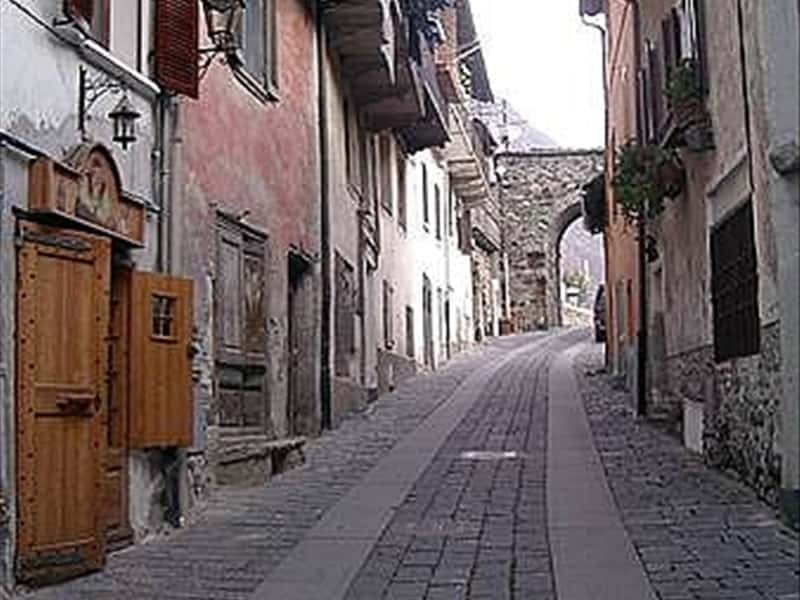 In addition to the typical gastronomic products, such as the mocetta (a typical local salami), the area offers an excellent Val d'Aosta DOC wine made from grapes Picoutener Donnas. The discovery of engravings evidence that the area was inhabited since ancient times. The Romans have left an important trace, building here a piece of the Via delle Gallie, about 200 meters long, cut into a cliff, with a high arch opening, that was used as a main entrance to the ancient village, usually closed to protect the village during the night . From the Middle Ages to the nineteenth century, Donnas shared the same history and fate of other municipalities in the region, characterized by struggles between the feudal families and between these and the Savoy. The Church of St. Peter in Chains, built in 1828, in place of an earlier smaller building, which dates back to 1277. Of the ancient building only a bas-relief remains on the wall of the tower. The portal of the façade and interior decoration are the work of Valsesian artists Francesco and Lorenzo Avondo. The church has three naves divided by pillars and preserves a high altar in polychrome marble topped by a large canopy and four smaller side altars, a 1832 painting other Avondo depicting the Saints Apollonia, Lucia, Orso and Pantaleone, the walls of the choir feature two paintings from the period between the XVII and XVIII centuries, the pulpit decorated with carved panels depicting scenes from the life of St. Peter. The Chapel of St. Orso, located at the Western end of the medieval village, it was rebuilt in the XVII century. The Cchapel of San Rocco in the village of Martorey, founded in 1663 and restored in 1762, the façade is decorated with a fresco of the artist Pier Carlo Nomaglio depicting the Madonna, San Rocco and San Grato, dating back to 1862. The Chapel of the Sacred Heart dates back to 1898. The Chapel of Bondon, dedicated to the wedding of the Virgin. The Chapel of Albard with its façade dated 1756. The Chapel dedicated to the Transfiguration of Our Lord in the alpine area of Verale, founded in 1753. Traces of the Roman road "Via delle Gallie" at the entrance of the village. This town web page has been visited 14,067 times.